As growers and partners, we appreciate the importance of delivering both variety and consistency. Over the past forty years as growers and partners to some of the best chilli production sites around the world, we pride ourselves on the quality of all our products. We provide a comprehensive range of chillies that are guaranteed to add an eye-watering sensation to any dish. Likewise, many chillies can be used for their rich flavour with fruity undertones depending on variety. Our procurement teams have explored the world to deliver both the mildest and the hottest chillies from South America, the Caribbean, Africa, Europe and the Far East, and everywhere in-between. 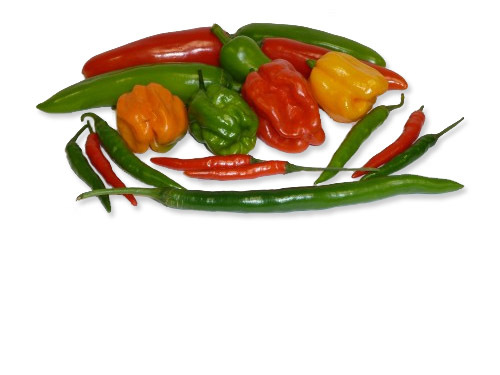 Cultivated chilli varieties come in a wide range of colours, shapes and sizes. With chillies, size is irrelevant and can be misleading as it is not necessarily the smallest nor largest which is hottest. The Scoville scale measures the level of heat a chilli contains, specifically the strength of the capsaicin the chilli contains. At the hottest end of the scale is Pure Capsaicin, with a Scoville rating of Capsicum (Bell Pepper) has a rating of nil. Whatever your requirements, we would be happy to assist you in selecting the most suitable chilli for both your recipes and manufacturing processes. In fact, some of our food-processing customers have even created award-winning sauces using our chillies. A mild thick fleshed green chilli with sweet flavour. A small but potent chilli popular in Thai cuisine. A long and slightly curvy medium heat chilli with no distinctive flavour. It is mainly used for creating spices in powdered form and for adding heat to meals. As it ripens to red, the chilli becomes hotter. Golden Heat Chillies are a useful, everyday chilli pepper that suits many a dish and looks attractive too. A popular mild chilli with a crisp and juicy flesh. Small lantern shaped chillies which are extremely hot. These are available in a variety of colours including green, red, orange, yellow and even chocolate. A short pointed tip chilli packing a punch. As it ripens to red from green, this chilli becomes sweeter.